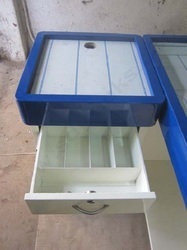 We are the manufacturer of wide range of Cash Counter.Our designers make use of their understanding of the market knowledge and requirement to craft the model of cash table.These have a wooden body and are appreciated for their sturdy construction, smooth edges, fine polish and accurate dimensions. We can provide customized solution with respect to the size, design and finish of the tables as per the specifications provided to us by the client. 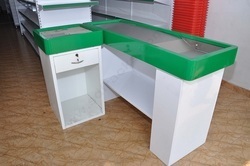 We are leading Manufacturer of Supermarket Front Counter and our product is made up of good quality. Owing to our rich experience of this domain, we manufacture and supply the best quality of Checkout Counter. Designed as per the industry set standards, the offered retail checkout counter is used in various departmental stores, supermarket and hypermarket. Usage: Supermarket, Convenient Store, Store, Drug Store, Hotel, Restaurant, Bank. We are leading Manufacturer of Supermarket Cashier Counter and our product is made up of good quality. We design supply various styles of Supermarket Cash Counter, money counters for different floor plans customer requirements. 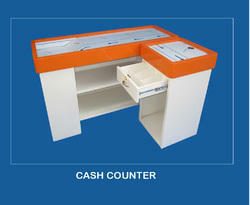 Our supermarket cash counters, money counters are made of high quality SS material. We are leading Manufacturer of Billing Counter and our product is made up of good quality. Our company has achieved laurels in Cash Counters to the clients. Cash Counters are manufactured using optimum grade material and ultra-modern techniques in adherence to set industry norms with help of expert professional. Our cash tables are designed with appropriate number of drawers to help the cashier manage the cash effectively. Our designers make use of their understanding of the market knowledge and requirement to craft the model of cash table.